Description: Movie addict Scarlett O'Brien is finally living the jet-setting life she's dreamed of, but it all hangs by a shiny, golden thread. Flying between London and New York, running two businesses, and planning her wedding to handsome fiance Sean along with her best friends Oscar and Maddie--life couldn't be better. Then Scarlett meets paparazzi darling Gabriella Romero, and life suddenly becomes even more extravagant and glamourous. 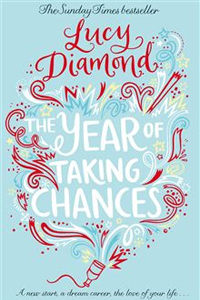 But as she begins to experience the other side of being rich and famous, it's not only Scarlett's perfect wedding that's put in jeopardy, but her whole world. Brits of all ages will be familiar with the story of The Railway Children, which was initially published at the beginning of the 20th century. 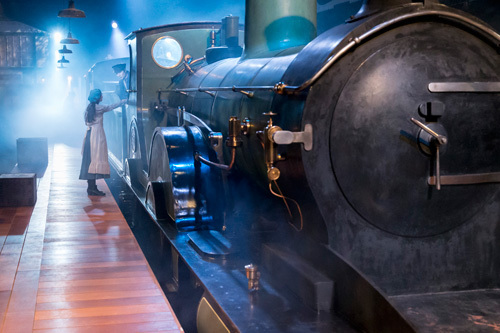 There have been adaptations in various shapes since - radio, television and film, to name but a few - but none are quite as immersive as the theatrical version, which manages to transport its audience to bygone days in the English countryside as soon as they set foot in the purpose-built theatre at King's Cross Station. My edition: Hardcover, to be published on 19 February 2015 by Weidenfeld & Nicholson, 309 pages. Description: Welcome to London, but not as you know it. The Nazareth Act has come into force. If you can't produce your identity card, you will be shot. Lalla, 16, has grown up sheltered from the new reality by her visionary father, Michael Paul. But now the chaos has reached their doorstep. Michael has promised Lalla and her mother that they will escape. Escape is a ship big enough to save 500 people. But only the worthy will be chosen. As a perpetual book lover I have of course always known about the magic hidden within the pages of a really good read and it seems the rest of the world has finally caught up and discovered their fabulousness too. There have been more page-to-screen adaptations in recent years than ever before – high-profile ones include the likes of Harry Potter, The Kite Runner, The Fault in Our Stars, Life of Pi, The Hunger Games and Gone Girl – with many more in the pipeline for this year; Me Before You, Fifty Shades of Gray, Miss Peregrine's Home for Peculiar Children, to name but a few, and of course Still Alice, adapted from the novel of the same name by Lisa Genova (Simon & Schuster, 2012), for which leading lady Julianne Moore has been nominated for a prestigious Oscar for Best Actress. The film has not yet been released in the UK, so I was really excited when I was invited to an advance screening at the lush Soho Hotel by publishers Simon & Schuster. It was lovely to see the team before the screening and they did not only have copies of the novels on hand for attendees but even gave me some tissues because, I was told, I was going to need them. Now that is what I call an excellent service. I admit I knew little about the film before going in (I had not even read the book yet, shame on me) other than it would be focus on a relatively young woman being diagnosed with Alzheimer's disease. This meant that other than Julianne Moore starring as titular character Alice I didn't even know who else would be in the cast. So when Kristen Stewart made her first appearance on screen as one of Alice's children, I inwardly sighed and rolled my eyes as I don't think she's the strongest of performers and I worried she would bring down the quality of the film. I needn't have worried, as she was really rather excellent as the youngest of three siblings trying to cope with the rapid decline in the mental state of their mother and the person they knew her as. While seeing the struggles of each of the siblings, as well as Alice's husband (Alec Baldwin), created an engaging palette for the audience to connect to the story, it was Julianne Moore's mesmerising performance which carried the film and made it such an exceptionally moving story. Of course the subject matter is harrowing in its own right, but without the right person taking on the role it would never have been such a poignant experience. I was completely gripped from start to finish and when the title screen appeared I was actually taken aback that the story had already come to a conclusion. In just an hour and a half I felt like I'd become incredibly close to Alice and her family and I was not yet ready to let go. The sniffling and tissue-rustling all around me in the cinema confirmed that it was a definite tearjerker of a film, but it was also incredibly beautiful and thoughtful; well worth a trip to the cinema. Still Alice will open in cinemas across the UK on 6 March 2015. Last year I visited The King's Head Theatre, London's oldest surviving theatre pub, for the first time for Neil LaBute's Autobahn. Up until that point I'd always been wary of a 'theatre above a pub' (or at the back of the pub, as is the case for this one) as I'd been spoiled by years of visiting the grand, ornate theatres that fill the West End. So I was very pleasantly surprised when I saw that the auditorium was a completely soundproof and separate part of the establishment, with reasonably comfy seats and an excellent view of the stage from all angles. 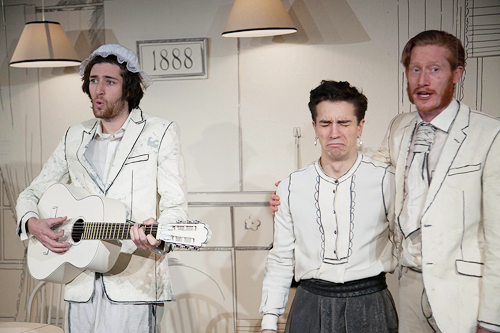 The quality of the production too was much better than I'd expected, so when I received an invite to press night of The Diary of a Nobody at the same theatre, I didn't have to think twice before accepting. My edition: paperback, published on 23 June 2014 by Lion Fiction, 320 pages. Description: She had been looking for somewhere to stay, but instead Marion Miller finds herself on the wrong side of the reception desk at the Peace and Pigs campground and, despite her horrible shyness, promptly lands herself a job. Marion came to Nottinghamshire--home of Sherwood Forest--to discover her father's mysterious past, but all she has to go on is a picture of her father dressed up, it would seem, as Robin Hood. 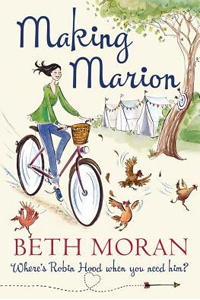 Life on a busy campground challenges Marion's formerly controlled life--the pigs roam free, the resident chickens seem determined to thwart her, and an unfortunate incident with a runaway bike throws her into the arms of the beautiful, but deeply unimpressed, Reuben. Yet, Marion's would-be boyfriend Jake, and Reuben's stunning fiancee Erica, conspire to leave little room for Marion to daydream about the twinkling eyes of her rescuer . . . Will Marion ever find peace, and perhaps even love, among the pigs? Set in Madrid in the late 1980s, the disco-coloured, pop-infused black comedy centres on Peppa (Tamsin Greig, starring in her first musical theatre role), a middle-aged actress who at the start of the story is dumped by her long-time boyfriend Ivan which, you guessed it, brings her to the brink of a nervous breakdown. 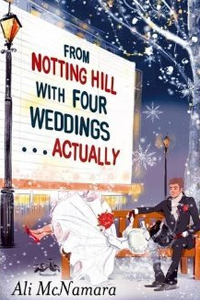 Throw in a delusional ex-wife, a hysterical best friend and a whole load of valium, and you've got the ingredients for this mad play with songs that at times resembles a good, old-fashioned farce. 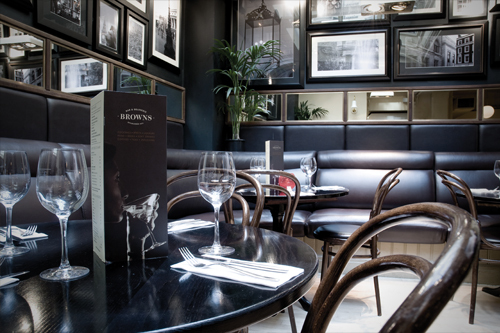 The first thing I noticed when walking into Browns Covent Garden was how swanky and sophisticated it looked; with a dark wooden bar area, followed by a more spacious but still classic restaurant section. And spacious it was, especially for the prime property location smack-down in London's West End, neighbouring the prestigious the Noël Coward Theatre no less. My edition: Paperback (proof), to be published on 3 February 2015 by Headline, 206 pages. 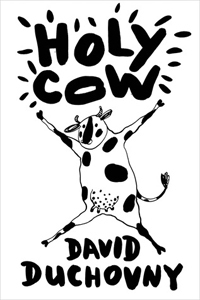 Description: Elsie Bovary is a cow and a pretty happy one at that. Until one night, Elsie sneaks out of the pasture and finds herself drawn to the farmhouse. Through the window, she sees the farmer's family gathered around a bright Box God - and what the Box God reveals about something called an 'industrial meat farm' shakes Elsie's understanding of her world to its core. My edition: ebook, published on 7 October 2014 by Ballantine Books, 353 pages. Description: Nestled in the bucolic town of Green Valley in upstate New York, the Pennywort farm appears ordinary, yet at its center lies something remarkable: a wild maze of colorful gardens that reaches beyond the imagination. Local legend says that a visitor can gain answers to life’s most difficult problems simply by walking through its lush corridors. Yet the labyrinth has never helped Olivia Pennywort, the garden’s beautiful and enigmatic caretaker. She has spent her entire life on her family’s land, harboring a secret that forces her to keep everyone at arm’s length. But when her childhood best friend, Sam Van Winkle, returns to the valley, Olivia begins to question her safe, isolated world and wonders if she at last has the courage to let someone in. 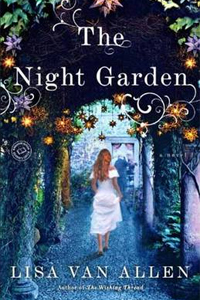 As she and Sam reconnect, Olivia faces a difficult question: Is the garden maze that she has nurtured all of her life a safe haven or a prison? 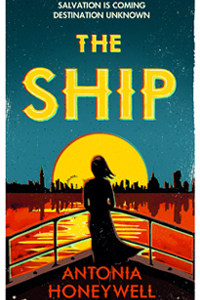 My edition: hardback (proof), to be published on 15 January 2015 by Hodder & Stoughton, 323 pages. Description: This is a book about phobias and obsessions, isolation and dark corners. It's about families, friendships, and carefully preserved secrets. But above everything else it's about love. Finding love - in any of its forms - and nurturing it. Miss Hayes has a new theory. She thinks my condition's caused by some traumatic incident from my past I keep deep-rooted in my mind. As soon as I come clean I'll flood out all these tears and it'll all be ok and I won't be scared of Them anymore. The truth is I can't think of any single traumatic childhood incident to tell her. I mean, there are plenty of bad memories - Herb's death, or the time I bit the hole in my tongue, or Finners Island, out on the boat with Sarah - but none of these are what caused the phobia. I've always had it. It's Them. I'm just scared of Them. It's that simple. As a lover of both screen and stage entertainment, combining the two into one has always appealed tremendously to my inner musical theatre geek. Adapting a stage production for cinema viewing doesn't always work – after all, you lose the intimate connection with the actors which makes going to the theatre such a special experience – but when it does, it can be glorious musical perfection (see Les Misérables). So when I learned that Disney (something else I'm already not so secretly geeky about) was turning the Stephen Sondheim and James Lapin magical musical Into the Woods into a movie, starring some of my favourite actors nonetheless, I was sold before the first teaser to the teaser trailer had even hit the web. And after many months of anticipation, racking up the view count to the official trailer on YouTube by several dozen in the last week alone, seeing the wondrous story unfold on the big screen did not disappoint. First things first, I should admit that while normally I'm an advocate for reading a book before seeing the film, and so seeing the theatre production before seeing the cinematic adaptation, despite my best efforts I've never actually seen Into the Woods on stage. So I can't compare the film to the source material; I don't know how well the original version translated to the screen or what – if anything – has been changed to cater to a different and more global audience. All I can say is that I hope that the book and music have stayed true to the original, because from what I've seen on the big screen it is phenomenal, and I can only imagine how impressive it would be to see this being performed live on stage. 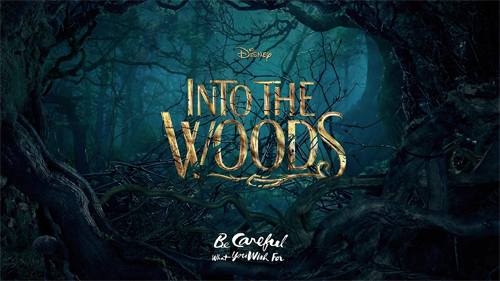 Into the Woods tells the story of a whole slew of famous fairytale characters, who keep running into each other in the woods until eventually their individual tales cleverly entangle into one wondrous adventure. 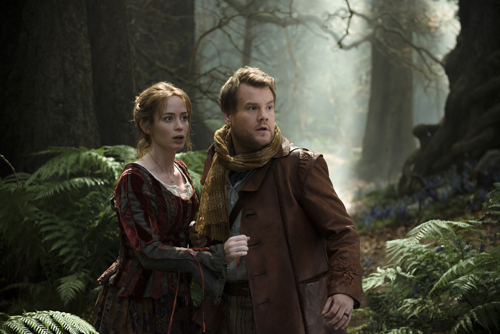 The main focus is on the Baker (James Corden) and the Baker's Wife (Emily Blunt), who due to a curse from the Witch-Next-Door (Meryl Streep) can't have a baby. Lucky for them, the witch is willing to reverse the curse if the baker and his wife will just collect four magical items for her before the blue moon, which is to appear in three midnights. The fantastical scavenger hunt leads them to Cinderella (Anna Kendrick) for a golden slipper, Little Red Riding Hood (Lila Crawford) for her red cape, Rapunzel (Mackenzie Mauzy) for a bit of her hair as yellow as corn, and Jack from the beanstalk (Daniel Huttlestone) for his milky white cow. Despite the large cast of characters (there are even more main ones than mentioned above), each of the leads had plenty of chance to shine. And shine they did. There wasn't a single person I was most impressed by, but I did particularly love Emily Blunt, who knew she could sing and so beautifully at that? ; Anna Kendrick, getting back to her Broadway roots with some fantastic solo numbers; James Corden, whose performance was both the comedic highlight and at times immensely moving; Meryl Streep, who has come leaps and bounds as a singer since Mama Mia! ; and Chris Pine, who was effortlessly charming (though not sincere) and swoon-worthy in his turn as one of the two princes roaming around the woods. I also want to give a special mention to young Lilla Crawford who was simply sensational in her solos. I was fortunate enough to catch her in the titular role of Annie on Broadway and I still remember her stunning rendition of Tomorrow. She was breathtaking then and she's only gotten better since. The excellent cast aside, Sondheim can be an acquired taste at the best of times but the music to Into the Woods is catchy, whimsical and absolutely magical. Particular highlights were the Prologue, which instantly transported me to the fairytale land while cleverly introducing all the characters in a single song; On The Steps of the Palace, a beautifully shot sequence in which Anna Kendrick really shows off her singing chops; and Agony, a hugely amusing scene featuring the two princes showing off their charms – and abs. There wasn't a weak piece of music in the film, but these three really stood out to me. Simply put, Into the Woods was magical, unexpected and so very wonderful. The new year has only just begun but I do believe I have already seen one of my top films of 2015, which is a promising way to kick off a fresh year of new cinematic and theatrical experiences. 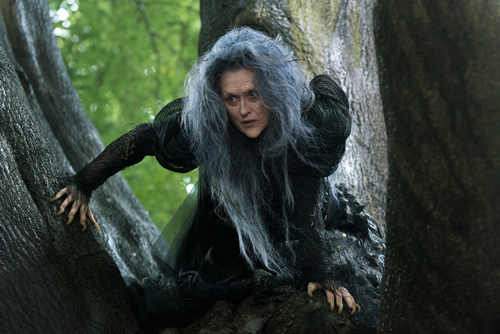 Into the Woods is playing in cinemas across the UK from 9 January 2015. Many thanks to Laughing Buddha and Disney for tickets to an advanced screening of the film in exchange for an honest review. 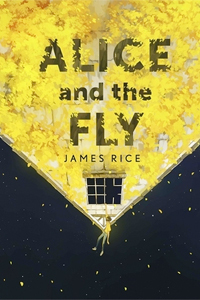 My edition: paperback, published on 1 January 2015 by Pan Macmillan, 454 pages. Description: It's New Year's Eve, and Gemma and Spencer Bailey are throwing a house party. There's music, dancing, champagne and all their best friends under one roof. It's going to be a night to remember. But as the following months unfold, Gemma, Saffron and Caitlin find themselves tested to their limits by shocking new developments. 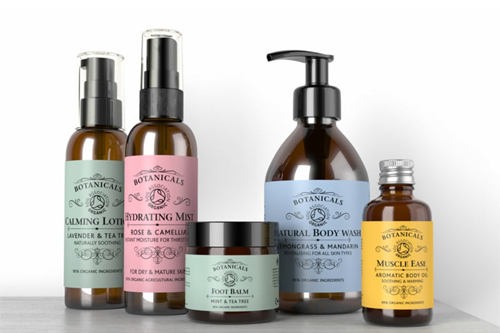 Family, love, work, home - all the things they've taken for granted - are thrown into disarray. Under pressure, they are each forced to rethink their lives and start over. But dare they take a chance on something new?